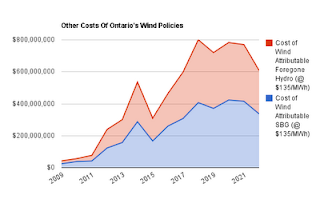 My previous post contained the promise of more data modeling work, allowing for an estimate of the true cost of Ontario's Electricity policy, particularly the cost of increased industrial wind turbine (IWT) capacity in an existing low-emission, but low flexibility, supply mix.. The modelling is competed and the next cost, for hydro capacity that cannot be matched to Ontario's demand with the planned wind capacity installed, is almost $3 billion. My model picks up where the baseload calculations left off. The supply need the model establishes as; the estimated provincial demand less the nuclear, baseload hydro, baseload gas, and both with anticipated wind ouput, and without it. The difference between the two calculations provides the claimed cost due to increased IWT capacity. In the case of the hydro component that isn't considered baseload (modeled off table A9 of this IESO spreadsheet), the challenge is in assigning it both in light of the maximum capacity that can be used, and the overall capacity factor available over a time period. I've noted before Ontario lacks reservoir storage - but water levels can be varied to allow output to meet demand within a range of time, which I've set as a week in the model. The capacity factors are taken from the time period I have the best data for - which is September 2010 through August 2011. I didn't see this as problematic as I've been comparing data to 2005 totals in some other projects, and the totals for those two periods are very similar. However, 2005 actually wasn't a great year for hydro output, and backtesting the model, total hydro output is below actuals, especially for the more productive years (2008 and 2009). Additionally, the model shows excess hydro supply during the Sept. 2010-Aug. 2011 period the model was built on. The peak possible supply is 66-73% of capacity, based on monthly actual peak hydro supplies from the test period, adjusted upwards, or downwards, into this range (the range is from slide 22 of this OPA document). All of which is a very dry way of communicating that if the model has a bias on hydro, it is a low bias and the figures provided are understated. The figure is $2.9 billion dollars. To be clear, as with the surplus baseload, the model does not include exports - in our real environment some of the excess supply might be dumped on an export market at already depressed, and trending down, prices. This is, as I've said, the fourth post is a series inspired by “The Impact of Import Dependency and Wind Generation on UK Gas Demand and Security of Supply to 2025,” from The Oxford Institute for Energy Studies. The final piece of data calculated in the hourly model, from 2003 through the end of 2022, is simply everything that is left necessary to meet demand. I have not modeled solar (I have mentioned if I receive an email with month, hours and capacity factors I'll try to get around to doing so), nor am I attempting to figure in biomass, etc. The bulk of this catchall group will be natural gas. 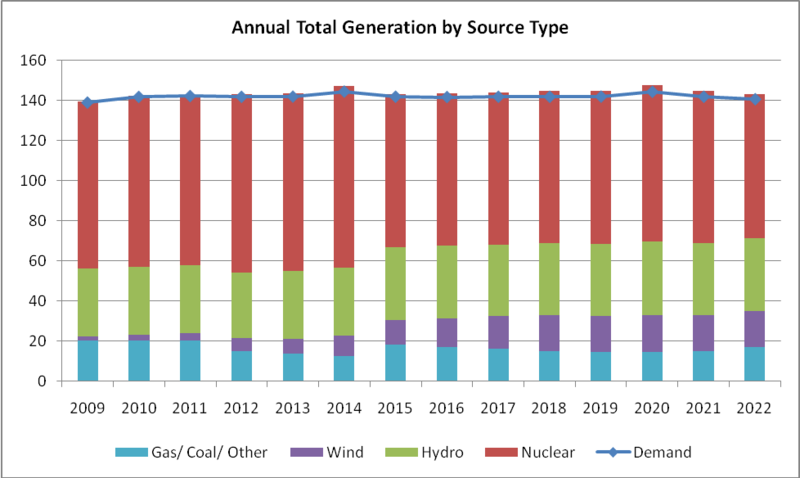 Currently some coal is there, but it's usage is already greatly diminished - in 2010 for every 5 MW generated with natural gas 3MW were generated with coal. This year only 1MW is. The Oxford study concluded: "...depending on the assumptions made ... the scale of gas consumption in the power sector by 2020 will need to be little changed from 2009 levels, even with 28GW of wind capacity." (pg. 84). 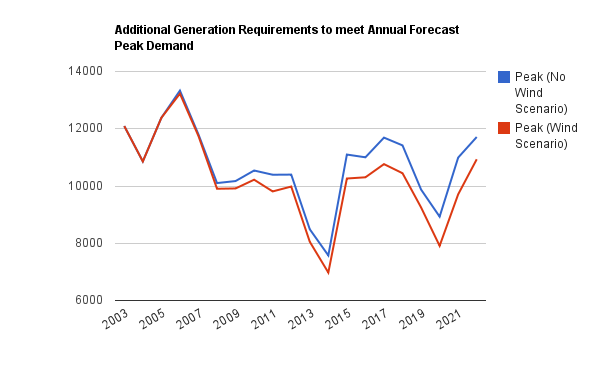 In Ontario, natural gas-fired generation produced about 14TWh in 2009, and by 2022, the need will be for about 17TWh of generation to meet peaking needs. 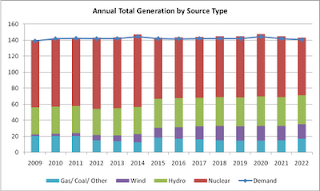 Despite planned growth of 3000MW in wind capacity after 2014, the production from gas, or comparable peaking sources, is never as low as in 2014. The model's peak year for nuclear generation is 2014. On a data note, these are 'fiscal' years and 2014 and 2020 have a 53rd week (weeks start on Wednesday in this data set). 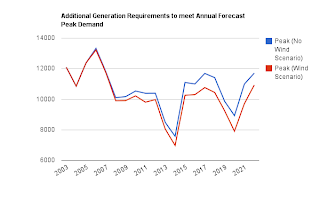 More intriguing yet, querying the data set, to see how much peaking capacity is needed to meet annual peak demand, shows that by 2022 we aren't better off than today despite the addition, in the model, of 5000MW of wind capacity and 1000MW of hydro. I noted the wind capacity was clearly just extra, in the first 2 charts of my first post in this series. I've now constructed 175320 records in a data model to confirm the obvious. The largest cost of wind is the annihilation of markets that it brings, and with it, the destruction of value in viable generation technologies.